ROLPA, Feb 3: Just 10 students enrolled at the Chaturbhuj Primary School of Khungri in Rolpa this year. Since some of these students do not attend the school regulary, only five or six students are present in their classes on an average. There are three temporary teachers, one assistant teacher, one permanent teacher, and a peon at the school. Until a decade ago, the school was in good standing. Around 50 students used to study at the school at the time. Over the years, the popularity of English medium private schools among the locals have grown and this trend has left community schools high and dry. Of the school’s six classrooms, five are locked. All the students sit in one classroom and teachers teach them in a group. “We keep all the students in a single classroom and teach them in a group. As they are very few we teach them in a group as keeping them separate is not practical,” Giri said. While private schools are increasingly proving the community schools incompetent, foreign employment has also given locals the ability to send their children to costly schools. In recent years, the trend of going overseas for foreign employment has grown here. Any children whose either parents are working abroad hardly go to a community school. However, Netra Giri has a different opinion on the issue. He opined that the condition of community schools can change if their teachers become more serious. If community-run schools start improving, the children who have gone to the private ones may come back, he said. If the teacher-student ratio looks odd in any school, the local body can intervene. According to Netra Giri, he is thinking to take steps to merge community schools which have been struggling to survive in lack of students. “Even the children of the school management committee members do not go to the school that they manage. Similarly, community school’s teachers’ own children attend private English medium school. If we are sending our kids to boarding school for better education, how can we expect the public to send their children to community schools? So, change has to happen within community schools itself,” he said. In his ward, other few schools including Dipendra Primary School and Kalika Primary Schools are also on the verge of closure due to the lack of a sufficient number of students. The situation in other wards is no good either. Private schools are actually growing in Rolpa. According to Bharati, it is imperial to improve community schools for the good of society. And for this, the government must come up with strategies and policies. “The local government, if it takes necessary steps towards this, things can improve,” he said. 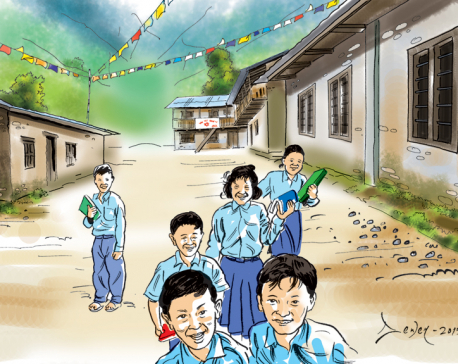 Community schools in Dhanmuda, Chiyuridhara, Laltibang and Libang, among other areas of Rolpa are fast losing their students to private ones, too. Noticeably, due to poverty and family circumstances, a huge number of children in Rolpa are still out of school and are engaged in child labor. ROLPA, Nov 10: Out of the total 407 community schools in Rolpa district, 232 schools do not have any government-assigned teachers.